We wish to first cover the story of the IDF rescue of the eight-hundred White Helmets (Syrian civil organization of emergency responders) and their families from southern Syria war zone. Coverage by Arutz Sheva with a short video can be viewed here. This operation was carried out by Israel in response to pleas from President Trump, Canada and other European countries. One can only wonder how long before the same Europeans claim that Israel is not a nice nation as is their usual. 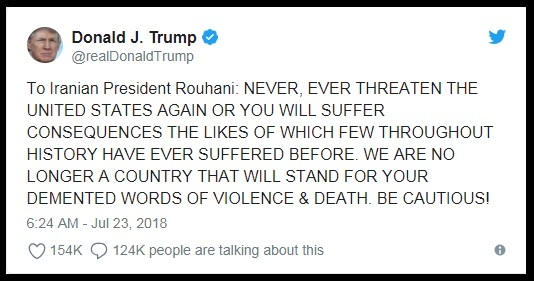 United States President Trump and Iranian President Rouhani have been exchanging verbal threats with President Trump adding in a social media Tweet just for good measure (see image below). President Trump even went so far as to use “caps lock” just for emphasis. President Rouhani promised in his retort to something President Trump stated which he found upsetting, that, “Peace with Iran would be the mother of all peace and war with Iran would be the mother of all wars.” We seem to remember a neighboring country’s ruler promising an American President the “Mother of all Wars” once before and that did not end all too well for Saddam Hussein. The reality is that Iran very well could be speaking from a position of relative strength unlike Saddam Hussein. We thought we would play with some thoughts, fears, and potential realities which should be taken into consideration and all intelligence gone through with a fine tooth-comb before stepping into the void. Iranian President Rouhani could have the ability to back up much of his threat with very real actions. Iran has been researching nuclear weaponry in various forms since the late 1980’s or, at best, the early 1990’s including specific research into EMP devices and miniaturized warheads. For argument’s sake, we will pretend that Iran had no real urgency about their research, something of which we actually believe they likely had a great deal, and their research proceeded at a leisurely pace. The Manhattan Project started in 1942 and developed the atomic bomb within three years and the United States tested their first hydrogen bomb, a thermonuclear bomb, within ten years of the start of the Manhattan Project. The United States had to start from scratch while the Iranians had knowledge on the architecture for both atomic and thermonuclear devices almost from the start. Their main difficulty was the processing or manufacturing of sufficient Uranium-235 or Plutonium-239 for the core of their devices. One item which is well known to those who have been paying attention to Iran is that they have been developing more and more advanced centrifuges capable of separating out enriched Uranium-235 at a fairly well advanced pace. Further, it can be assumed that their cooperation with North Korea has permitted them to test at least one or two devices over the years if not numerous more. They also would probably have exchanged information back and forth both on nuclear weaponry and guided missile technology which explains both nations’ fairly rapid advancement in both areas. Lastly, as the Chinese very likely had stolen or otherwise received the complete schematics and machining and design specifications for the United States W-88 warhead, it can be assumed that both North Korea and Iran have had access to that same information, though one could hope such is not the case. We are attempting to avoid using hope as our main argument in this instance. So, it is painfully obvious that by the year 2000 Iran would easily have built sufficient processing facilities to produce the fissile and fusion elements for the production of thermonuclear warheads and the sole question is how many devices might they have produced. This is where estimates have been all over the board. According to sources reported and quoted by the Times of Israel, “Tehran has crossed all points of no return and already has its first nuclear weapon, and maybe more.” The same article also reports that the IAEA has assured the world that Iran in no way could have conceivably developed and built a nuclear bomb. We recall that the IAEA are the same people who claimed Saddam Hussein was not working on nuclear weapons, that Syria had no nuclear weapon dreams, that Libya had no nuclear program and that North Korea was years from being able to produce a nuclear weapon days before their first nuclear test. 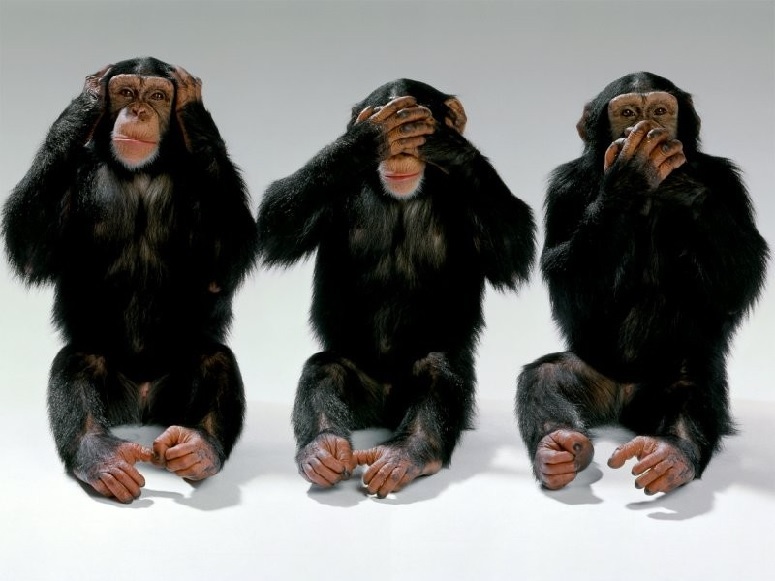 The IAEA has not been the most reliable source on nuclear proliferation as they are presumed to be preventing it and have decided that if they see no evil and hear no evil then they are able to speak no evil. Below we have included an artist’s rendition of two IAEA inspectors and one spokesperson. The evidence is that should Iran have desired to construct nuclear weapons, then the only question remaining is exactly how many of them have they produced, what are their projected yields and how distant can their missiles deliver them. These are serious questions which deserve answers which should be made known to the world through the United Nations or by the nation who knows the reality making the knowledge more generally known. This means if the CIA has solid evidence proving that Iran has nuclear tipped missiles, they should be producing such evidence for the world to see and reveal the perfidy of the Iranian claims of innocence and having no desire to become a nuclear-armed nation. As things currently stand, it would be more prudent to assume that Iran has nuclear tipped missiles in the ready and that these missiles are capable of striking anywhere on the planet. It should also be assumed that they would have such shorter-range missiles stored within what appear to be normative cargo vessels as they have developed such vessels to use to strike at cities along the shores of the United States and Europe should hostilities become to their advantage. These missiles would be extremely difficult to intercept, as their targets would be struck within minutes of the missile launching, as the ship would be only one-hundred miles offshore or closer. Iran has tested these systems finding them to be accurate and an efficient and difficult to deter system for delivering a warhead. The cargo ships they would utilize would more than likely be registered with a country other than Iran making them all but invisible unless the warhead could be detected. Iran is also rumored to have developed a non-nuclear EMP device which is capable of destroying the electrical grid for a city and surrounding region depending on the level of hardening the electrical grid has had installed. One can pretty much expect that at least the streetlights and traffic signals would be affected and stop functioning for a period of time. The real problem is if transformers are destroyed and the larger the transformer, the more serious the outage. The largest transformers can take up to two years to produce in sufficient numbers should an entire grid region be destroyed. The truth is that both President Trump and President Rouhani are playing with fire and their bellicose threats can escalate potentially leading to one or the other taking the decision that the insults have reached a level beyond that which they are willing to accept and in order to save face they must act. This could lead to problems and further escalations which could end further than desired from the starting point. The Iranians including Iran Revolutionary Guards Corps (IRGC) Commander Mohammad Ali Jafari has promised that should the United States prevent Iranian oil sales, they will prevent all oil from traversing the Straights of Hormuz. According to Xinhua, Jafari stressed, enemies can understand the meaning of Hormuz Strait “either for all, or for none.” The United States has promised that they will protect the use of the Straights of Hormuz for the oil shipments of both Saudi Arabia and Kuwait, so should President Trump prevent Iranian oil shipments and Iran act on their threat, there would necessarily be a confrontation. Iran today is not the same Iran which fought Saddam Hussein during the 1980’s. They have more potential and are well practiced at their swarming tactics which create a great deal of difficulty against which to defend. Any naval confrontation within the Arabian Gulf and especially the Straights of Hormuz would also include Iranian shore batteries which would take time, short as it may be, to render inoperative which would also be seen as a further escalation. One can readily see how any confrontation over the free movement of oil in and out of the Straights of Hormuz could very quickly spin out of control. One can only guess as to how the United States would react should one of their nuclear aircraft carriers be attacked and actually sunk. Such would lead to reprisals which would provoke reprisals in return and back and forth until something inevitable and regrettable resulted. Wars have started over far less; take World War I for example. How many people died over a single terrorist act murdering Archduke Franz Ferdinand and his wife Sophie the Duchess of Hohenberg. So, now we are at the point of which leaders lower their level of vitriol, and let us pray one of them sees the wisdom in doing exactly that. Why not just get the most over-hyped part out of the way right off the bat. Yes, FBI lawyer Lisa Page sent a text message to her lover at the FBI asking, “(Trump is) not ever going to become president, right? Right? !” with an actual ?! which where we come from shows distress, uncertainty and heightened anxiety. Then the fateful reply from FBI agent Peter Strzok who texted back stating, “No. No he won’t. We’ll stop it.” So, what can we conclude from this evidence? Well, that the rest of the five-hundred page report will end up as fodder for the mainstream media while social media will be tossing back and forth how that exchange is meaningless and also that it signifies the end of the world, it all depends upon which side of this battle you side. We have a different take on the whole report and a few of the outstanding minutia which we believe should have sounded alarm bells somewhere within the FBI or the Justice Department but obviously did not. The first thing is this was the Justice Department selecting an inspector to inspect the FBI which is part of the Justice Department. The fact that this investigation found absolutely nothing untoward should have been the expected response. Basically you had an enforcement officer from the Justice Department investigating if the department which pays his salary did anything wrong. Why is it we see something not quite right here? Well, because this investigation which was largely to see if there was any bias in favor of Hillary Clinton and/or against Donald Trump during the 2016 election cycle was performed by the agency where the bias presumably was centered while the investigation into whether Trump’s campaign was working hand in glove with the Russians went to a special prosecutor. The important difference there is the special prosecutor is paid independently and thus will often be more thorough. Both of these investigations should have been investigated by a special prosecutor or neither of these investigations should even have been executed. Having the Justice Department investigate the Justice Department is the quickest means to reaching a conclusion that nothing was done which requires any further investigation, now can we get back to running the country as we see fit while basically ignoring the President and Congress unless we agree with them. But we believe there was one little item which really should have set off alarms. This concerns FBI agent Peter Strzok. Even before his little reassuring text message, there was something not quite correct in his behavior. Mr. Strzok was part of the investigation by the FBI into Hillary Clinton’s use of a private e-mail server. Mr. Strzok was part of the investigation by the FBI into collusion between the Trump campaign and the Russians. Mr. Strzok was initially part of the special counsel probe being run by Robert Mueller. Any normal human being would probably grow suspicious of any person who wormed their way into every aspect of investigating and potentially affecting the Presidential campaign. One would think that Mr. Strzok’s immediate supervisor would have at least called him in for a consultation and inquired as to what was it that had him working on so many closely related investigations. Then, a good supervisor would have made him give up at the very least one of the positions if not just choose which one in which he most desired to take part. Leaving one person in all three of these investigations was an error of management. 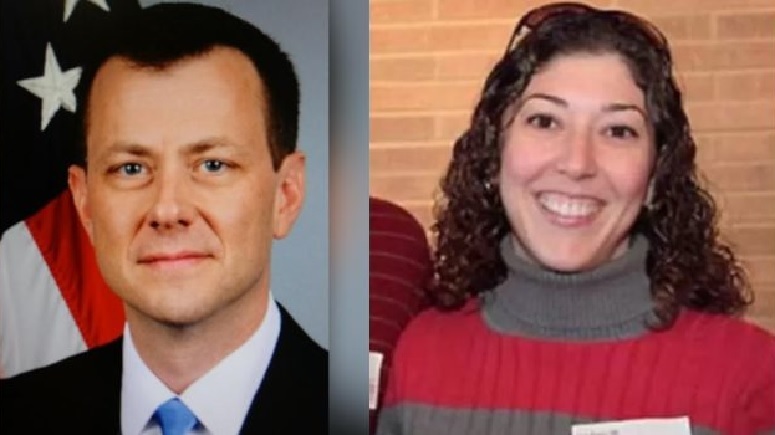 Additionally, Peter Strzok’s wife, Melissa Hodgman, was appointed by President Obama as Associate Director of the SEC’s (Securities and Exchange Commission) Enforcement Division in 2016. We guess the good news is that Joseph Burrow, the husband of former FBI lawyer Lisa Page, has a position which is not with the government and may actually be above suspicion of anything except probably really upset about his name being dragged like this because his wife was having too much fun at the office parties. What we love about this entire boondoggle is that it exposed something those of us who grew up around Washington D.C. already knew, that there is a government within the government which actually runs the day-to-day operations and because Congress grew fat and lazy, they also decide how the general concepts and ideas which Congressional legislation contains are interpreted and applied into regulations which have the weight of law. President Barack Obama understood this which is why during his first term; Cass Sunstein was named the Administration’s Regulatory Czar. President Obama’s initial instructions to Mr. Sunstein were to go through the legislation passed during the last decade and look for regulations which could be derived out of these pieces of legislation. Needless to say, Mr. Sunstein was very efficient and the number of regulations during President Obama’s first term was significant. 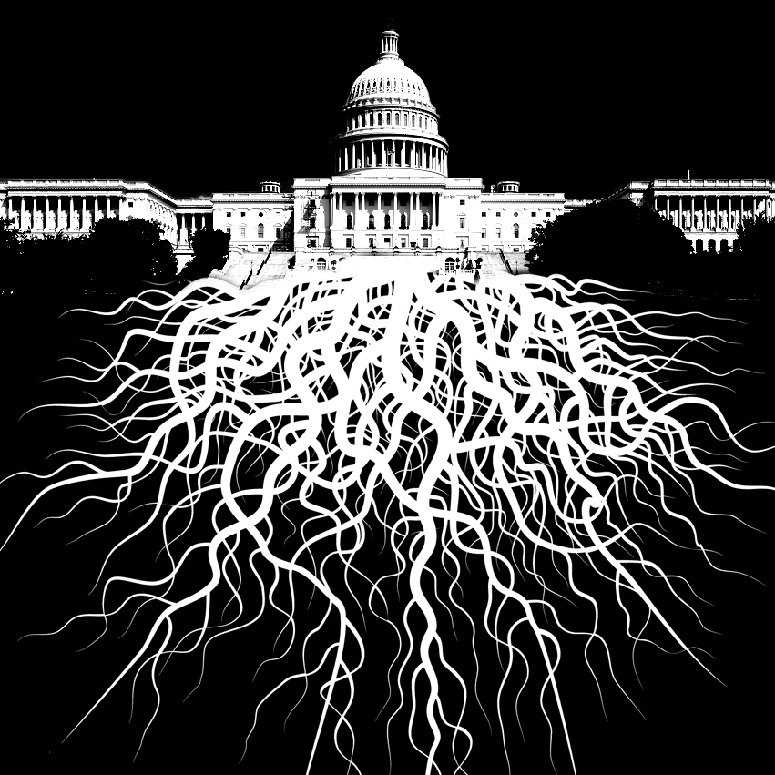 So, yes, Virginia, there really is a “Deep State” and it lives within the agencies which are largely manned by left-leaning to extreme left individuals with, every so often, a conservative who spends much time ducking to remain out of sight and hopefully out of mind. The reason for this is very simple to understand. During Republican conservative administrations, true conservatives, they more often than not put in place a hiring freeze, consolidate departments, which often lead to numerous government workers being sent to new agencies where they bump another worker who has less time in service at their level or is a lower pay grade who then bumps the next until the most recent hire found loses their job. The American Federation of Government Employees (AFGE) is a very strong and powerful union and has garnered near chiseled in stone guarantee that once you complete your probationary period you can only be fired if you really do something stupid like texting on your government provided computer, “(Trump is) not ever going to become president, right? Right? !” or reply to this text saying on your government provided computer, “No. No he won’t. We’ll stop it.” One of these people was forced from their position and the other merely demoted and barred from active investigatory positions. So, even doing such as these might not get you fired. So, Republican conservatives block hiring new personnel when they might have some sway in the process. Then when a Democrat or Republican Progressive and often leftist is elected, the flood gates open and the hiring circus begins and things are good in old D.C. This is how and why most federal government employees are liberal or even leftists and the promotion ladder is stacked even further to the left than the middle and lower level positions. President Trump has revealed this truth for the world to see. Unfortunately, most of the world, and even the American people, do not care and most honestly believe that there is nothing that can be done to repair this problem. The really sad news is that they are correct. Thomas Jefferson realized that this would be a problem, that with parties that the government employees would tend to be more from one party than the other and with time would create a poisonous atmosphere which would threaten the people’s freedoms and liberties. Thomas Jefferson stated it outright when he wrote to his friend William Smith, “The tree of liberty must be refreshed from time to time with the blood of patriots and tyrants.” Thomas Jefferson once confided that he believed for the United States to stay true to its founding declarations that it would take a revolution every twenty years to force the nations to start again from scratch with only the Declarations of Independence, the Constitution, and the Bill of Rights. This, in his opinion would be found to be necessary otherwise; the federal government would usurp the power of the states and become tyrannical. He was very likely a tad too pessimistic thinking twenty years, but two-hundred and twenty would probably have reached that stage in his mind. When people who have positions of such power as obviously Peter Strzok must have wielded getting on every investigation of note about the election all to work to the detriment of one of the candidates and the favor of the other, then there is a problem. That it took an investigation by an Inspector General to make possible the airing of the full scope of the problems was significant. What became even more significant was that the Inspector General was so invested in the swamp that is the Deep State that he saw nothing inherently wrong or partisan in these events. Basically, the report states that everything was just as normal as could be expected, all things considered. This is what is considered normal then there is a deep-seated problem and it needs to be pulled up by its rotting foliage, roots and all. But, that is something the American people need to wrestle with and decide. We hope that the solution found will be peaceable but thorough leading to efficient and balanced government similar to the initial days of the nation where the government represents the people and not represses the people. We wish you well as you enter your two-hundred-forty-third year. Richard Nixon was wrong, as wrong as wrong can be. He utilized the investigative powers of the Federal Government, the FBI, Justice Department, IRS and whatever might have aided his reelection, against his opponent, anything and anyone was a target, forging a theft which was his downfall. This was criminal in every way and President Nixon was fortunate to only have to resign and not spend many months or years in prison. His reputation was in tatters with everything positive he had accomplished now tarnished. His actions resulted in half a century of more and more liberal policies and culture taking over America. Now the tables have turned and the shoe is on the other foot and a million other trite sayings. The questions now revolve around where will the investigation lead and who will be held culpable. Some of the names tossed about range from lesser known until the recent political free-for-all while others are household names. 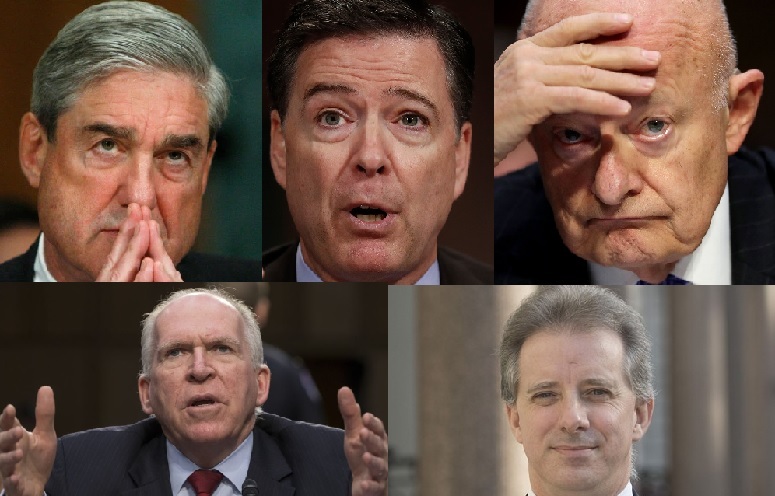 Who had heard of Mueller, Comey, Clapper, Steele, Brennan and other names which will become all too familiar in the near future, as everything plays out? Then there are the two names which we all are already very familiar with, former Secretary of State, Senator for New York and First Lady Hillary Clinton and former President Barack Obama. The same questions from the Nixon era will be heard all over again. Questions such as how high did it go, who knew and when did they know and a host of others will be thrown around and featured in article after article. Then there will be the big question, who, if anyone, will fall on their sword to save those above them who actually gave the orders. This was done and bartered into making himself into a folk hero of an odd sort when Lieutenant Colonel Oliver North in full uniform took total responsibility for the Iran-Contra Affair. His standing at attention while taking the oath and taking his valiant responsibility clearing President Reagan of any accountability. Now we have heard reports that former CIA Director John Brennan and former Director of National Intelligence James Clapper lied in their testimony given to Congress. This is a crime, obviously, defined by U.S. Code sections 1621 and 1001 of Title 18. These crimes could result in a maximum five-year prison sentence and potential fine. Both men are highly unlikely to actually face anything more than fines, especially if they are willing to give testimony leading to indictments of what are often called bigger fish. The truth should be sought over making the entire affair into some kind of vendetta. But there is a larger question involved this time around; is it worth the time, effort and attention for the Trump Administration to expend when the same efforts can be used to accomplish the Trump and the nation’s agendas. This is what we will attempt to predict. President Trump is unlikely to seek convictions of his former opponent, Hillary Clinton, or of former President Barack Obama. What the FBI and other agencies desire may be something of a different matter. The FBI and CIA will likely desire to clear their agencies of any hints of corruption and could turn on their former heads which might not fare well for James Comey and John Brennan. These two disgraced their agencies and these are not agencies which can stand for politics entering into their lairs as these are investigatory agencies whose reputation is for providing administrations of both parties with equal diligence. But as far as Clinton and Obama, they will probably not face any serious difficulties, well; Obama will not likely be facing any charges. Hillary Clinton may face some charges for her handling of classified information while Secretary of State but will get a pass in sentencing if the charges are even pursued. The one thing is this might prove to be an interesting circus to watch while the antics are filling the three rings with the media doing its finest job at making molehills out of mountains. In the meantime, the media will be making mountains out of absolutely nothing over the presumed Trump-Russia collusion fantasy. The mainstream media has become so unfortunately predictable. The main driving force in these investigations will probably be completely independent of President Trump and his closest team members. Coming from the business world, President Trump probably looks at the moves and machinations which were used to attempt to defeat his election as a done bad deal and in business; you move on from such difficulties and simply hope to never need to deal with such people again. President Trump is more forward looking and wants to get things accomplished, not dwell on things he would rather simply ignore and forget. President Trump has plans which he wants to get done and knows that looking back is counter-productive to getting everything accomplished as quickly as possible. President Trump probably has some long term plans which he realizes will take a second term, and he knows a second term is not a guarantee. This means he has a driving force to get as much accomplished as quickly as possible. This has been evident to anybody who has watched the blizzard of Executive Orders he issued almost as soon as he returned to the White House after the Inauguration. Things have slowed somewhat as much of what he desires to accomplish requires Congress, and Congress is a problem for Presidents, something Prime Ministers are unfamiliar with facing. A Prime Minister has the support of his coalition until he doesn’t, and then he has a problem which is called a new election. Presidents know when their next election is, they just are never quite sure if Congress will work with him, even if his party is in the majority. President Trump has realized that in spades. That brings us to what President Trump is probably most concerned with over the coming six months, the mid-term elections. He is about to attempt what most Presidents have found very difficult, increasing his party’s numbers in both houses at their first mid-terms. Sitting a mere 9,387 kilometers, or 5,833 miles, from Washington D.C., we must rely on articles to get a feel for the electorate and information on the tricky Senate where only one-third of the Senators are up for re-election at any election cycle. From what we have read, the predictions are all over the place with some predicting the Republicans gaining three to five seats while others predict the Democrats taking control of the Senate gaining as many as seven or eight seats. We are glad we will not be in the business of predicting the outcome of the thirty-five seats up for election, apparently there are a couple of special elections making it more than the normal thirty-three seats. Perhaps when the coverage becomes somewhat more informative closer to the election and we will know who made the biggest gaff or posted a disturbing Tweet we will be bold enough to take a stab at a prediction. The only prediction we can make now is that President Trump will probably work hard to retain the House of Representatives and try very hard to increase his majority in the Senate by at least three seats giving him a better advantage at accomplishing his legislative agendas. This will mean much more to President Trump than wasting efforts on gaining conviction against people for past grievances. That he will leave up to the wheels of justice which move ever so slowly that we often forget what the crime was when politicians face prosecution for past misdeeds.